Presentation of the Ewald Prize to John Cowley and Alex Moodie at the Opening Ceremony of the 1987 Perth Congress. Left-right: John Cowley, Alex Moodie, V. I. Simonov, Theo Hahn. In 1987 it was announced that the first Ewald Prize had been awarded to Professor J.M. Cowley (Tempe, Arizona, USA) and Dr A.F. Moodie (Clayton, Victoria, Australia) for their outstanding achievements in electron diffraction and microscopy. They carried out pioneering work on the dynamical scattering of electrons and the direct imaging of crystal structures and structure defects by high-resolution electron microscopy. The physical optics approach used by Cowley and Moodie takes into account many hundreds of scattered beams, and represents a far-reaching extension of the dynamical theory for X-rays, first developed by P.P. Ewald. 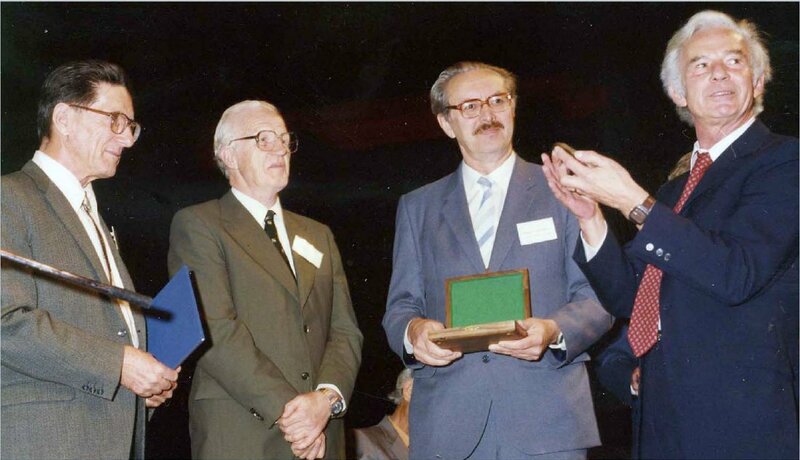 The presentation of the Ewald Prize was made during the Perth Congress Opening Ceremony in August 1987. For a list of papers by Professor Cowley appearing in IUCr journals click here. For a list of papers by Professor Moodie appearing in IUCr journals click here.